Pedestrian advocates say all the construction in the city is reducing visibility for drivers and blocking off sidewalks, creating dangerous situations for those trying to get around on foot. Walking through a construction site just north of Moss Park, Toronto resident Edith Sinclair points out all the potential safety issues for people passing through: A blocked-off sidewalk, a cluster of machines and workers spilling onto the already-narrow roadway and a sign pointing to a pedestrian walkway that doesn't exist. "It just feels like pedestrians are really an afterthought here," says Sinclair, who works nearby and travels through the site, near Dundas Street East and Pembroke Street, every weekday. Multiple pedestrian and cycling advocates have raised red flags about construction as a road safety issue during CBC Toronto's ongoing Safer Streets series, noting they make it harder for drivers to see vulnerable road users while often forcing those on foot into live lanes of traffic. So are these sites really hazardous for people trying to get around? While data is hard to come by, the numbers that do exist suggest concerned residents may have a point, with dozens of reported injuries in recent years — a situation that's prompting calls for more data tracking and oversight of the city's hundreds of work sites. Despite making efforts to keep people safe around work zones, the City of Toronto doesn't track the number of people injured near construction sites. That responsibility is handled by the province's Ministry of Labour. 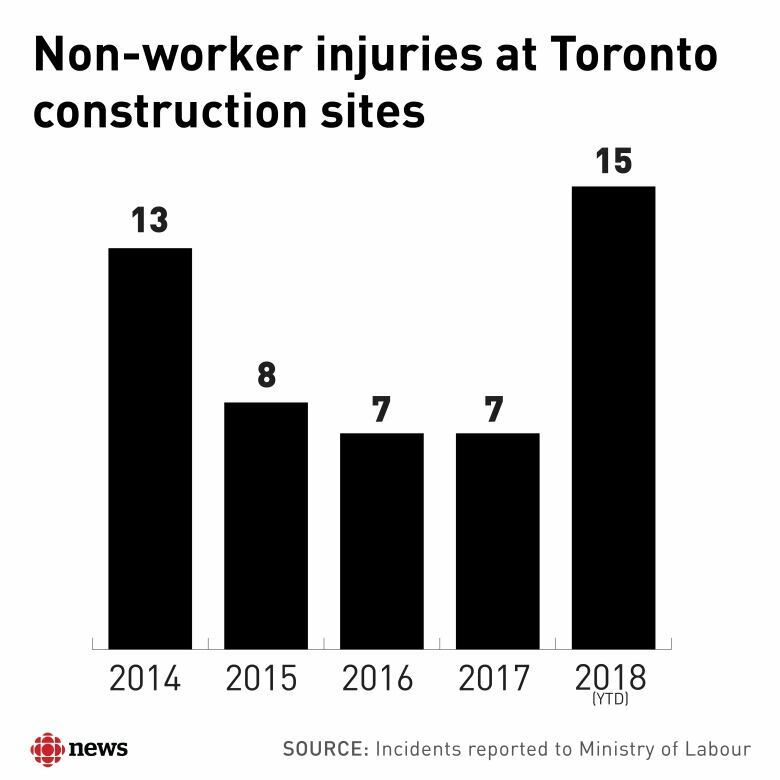 The ministry's data, compiled for CBC Toronto, shows there were 50 reported injury incidents — for non-workers, specifically — at or near construction sites, or involving construction companies, over the last five years. The Ministry said its data could involve any non-workers, including pedestrians, drivers or cyclists, but didn't break down exactly who was injured, nor how they were hurt. Fifteen of the reported incidents happened in 2018 — the highest injury count in the data — with three months still left in the year. Adam Cohoon, a spokesperson for pedestrian advocacy group Walk Toronto, said the numbers come as no surprise. "I'm usually having to get around some construction barrier, whether it's a major sidewalk closure or just a few pylons," says Cohoon, who uses a mobility device to get around his construction-filled Canary District neighbourhood. He also questioned if the numbers of injuries or near-misses happening is actually higher, since the province's data only shows reported incidents. One Canadian study also suggests a potential danger for cyclists. A 2012 peer-reviewed study, published in the American Journal of Public Health, recruited nearly 700 injured cyclists in Toronto and Vancouver to figure out how route infrastructure played a role in getting hurt. The researchers found construction sites were tied to a two-fold increase in the risk of injury. Six years after that study, there are hundreds of active construction sites across Toronto. There are currently more than 700 areas with road restrictions, according to city data, the vast majority of which are tied to construction. And when it comes to cranes in the sky, Toronto is number one in North America with nearly 100 of them, according to real estate consulting firm Rider Levett Bucknall's crane index. That count could keep rising, the firm notes, with another 400 construction projects proposed. So with construction a constant across Toronto, what does the city do to mitigate potential safety issues? Eric Jensen, the city's traffic operations manager, says staff review and approve construction zone activity, which is allowed to happened under permits issued by the transportation services department. Those permits are meant to ensure construction sites adhere to various pieces of legislation, including the Occupational Health and Safety Act. The regulations aim to protect pedestrians and separate them from traffic, Jensen adds, and "projects are monitored and adjustments are made to the road set up to address issues that may arise during construction." "In every case, safety is of paramount importance and every effort is made to ensure the maximum level of that safety for all road users, particularly the most vulnerable, while also protecting the workers on the site," Jensen says. But advocates say more can be done to ensure construction sites are safe spaces for people getting around. Cohoon believes speed limits should be lowered — potentially to 30 km/h — around all construction sites, to help slow down traffic in areas of reduced visibility. Pamela Fuselli, vice-president of Parachute, a national charity dedicated to injury prevention, says there also needs to be more data collection to ensure governments and advocates understand both the number of incidents and the context. "Knowing how many [incidents] is definitely a start," she says, referring to the province's data. Releasing data on who is being injured around construction sites, and under what circumstances — be it walking, or cycling, or passing by in another context — would help safety advocates find the best strategies for prevention, Fuselli says.